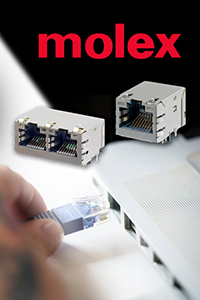 TTI, Inc., a leading specialty distributor of electronic components, is now stocking MXMag RJ45 Dual Port connectors from Molex. MXMag RJ45 connectors are robust, high-reliability magnetic jacks that provide an option for automated reflow-solder assembly solution designed to meet the stringent of customer demands and cost reduction requirements. Historically RJ-45 connectors with integrated magnetics have required hand-placement for wave-soldering operations to safely ensure a robust and reliable through-hole PCB connection. MXMag connectors have been specifically designed for automated assembly processes, both during the manufacture of the connector itself and the customer’s assembly process. Transitioning to pick-and-place magnetic jacks must not compromise the quality of through-hole solder joints and must offer the customer competitive product pricing. As a result of this design intent, customers gain from a robust, high-reliability integrated RJ-45 magnetic jack coupled with the cost advantage of increased assembly automation to meet current and future market demands. This entry was posted in Connectors, Connectors, Connectors, Europe, Global, North America, On Ticker, top articles, UK. Bookmark the permalink.